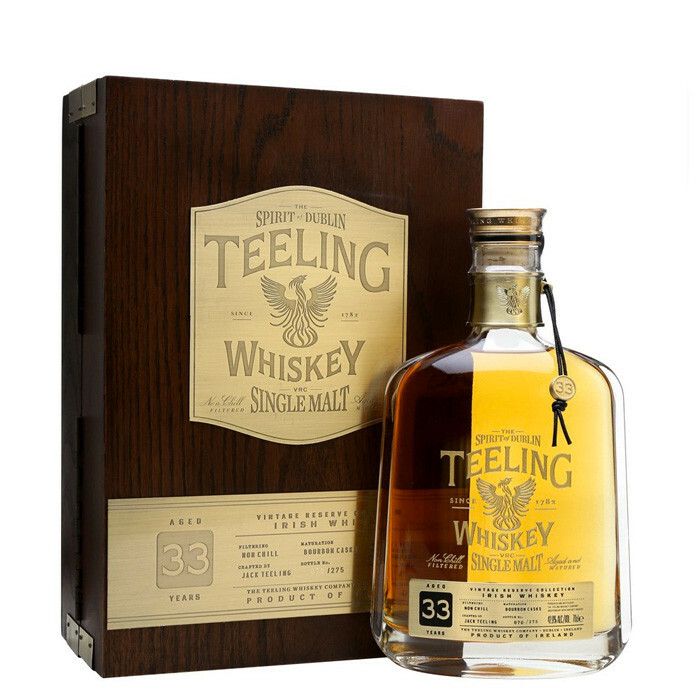 The 33 Year Old release which is limited to just 275 bottles, is believed to be the oldest bottling of Irish Single Malt recently released, making it the world’s most exclusive Irish whiskey. Distilled in 1983 and aged exclusively in two ex-bourbon barrels which after 33 years of maturation produced only 275 bottles at an alcohol strength of 42.9% straight out of the cask. To match its rarity, this historic bottling of Irish Whiskey produces a truly unique taste experience from its complex floral nose, to its deep layered flavours as a result of its 33 year journey and a long luxurious finish without being over oaked. Nose: Vanilla, cream, orange, toast, jam. Taste: Light and fresh, well balanced sweetness blends into notes of vanilla, sandalwood, allspice, and orchard fruits. Finish: Deep and inviting as the spice comes back and then goes away again. Vanilla, cream, orange, toast, jam. Light and fresh, well balanced sweetness blends into notes of vanilla, sandalwood, allspice, and orchard fruits. Deep and inviting as the spice comes back and then goes away again.